ASA partner Alice Tasca presented in the session Health, Education and Shelter at the African Design Centre Symposium. The event focused on how architecture and design become tools that through the process create a balance between urban trends and the urgent need to provide safe, sustainable dignified solutions to the cities of the African continent. Among 49 participants and 8 mentions, ASA studio receives the Honorable Mention for SOCIALLY ACTIVE ECOSYSTEM- ECD CENTERS FOR RWANDA, submitted at the ASF Award 2017. Click on the image for the results! Mugombwa Refugee Camp education facility and ECD&F centers featured by Apsaidal architecture website.​ Click on the logo and check it out. 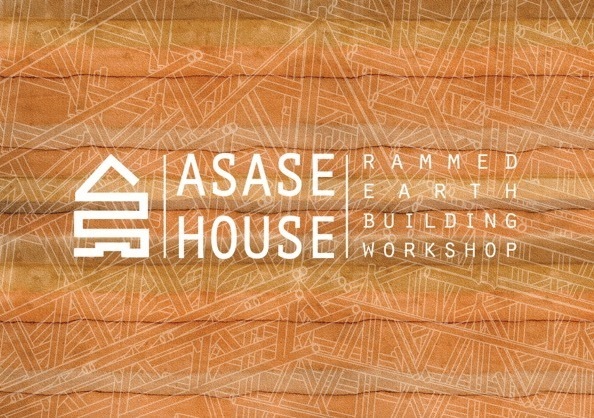 ASA studio receives Honorable Mention for NKA Foundation's MUD House Competition with the project ASASE House, Ghana. The prototype is expected to be built through students and community workshop in the summer 2016. Click on the image to know more and participate to the workshop. 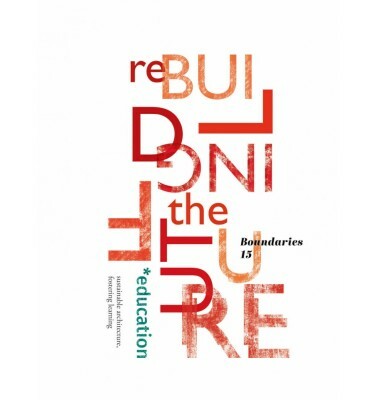 ASA's ECD&F Centers and Kintobo Health Center, designed with TAMassociati, are featured in ​Boundaries 15 and 16, international architecture magazine that focused on education and healthcare projects in developing countries. Click on the images and subscribe to receive your copy. Active Social Architecture is on this week’s episode of Social Design Insights discussing “​Can Design Challenge Inequality” with co-hosts Eric Cesal and Emiliano Gandolfi. Click to the button to listen to the podcast. 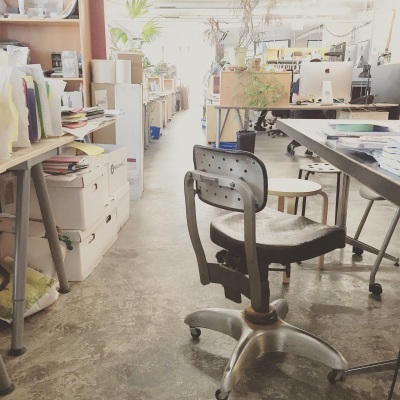 ASA's ECD&F Centers featured in ​​EarthWorks issue 25, architecture magazine that focuses on sustainable built environment makes the front page! Click on the images and subscribe to receive your copy. ASA studio and ASF Quebec are collaborating with PRECI in the design and construction of a new health post in Kunturo, Ngororero District, Rwanda.​ The exchange of knowledge and constant design iteration are the research tools that we prefer. 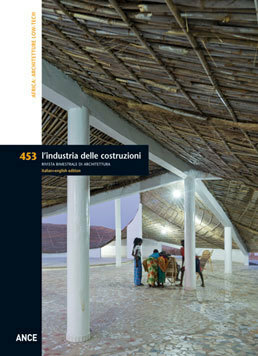 ASA's ECD&F Centers featured in the Italian architecture magazine ​​​​Industria delle Costruzioni n.453. Click on the image and subscribe to receive your copy. ASA studio submitted a project for Kaira Looro competition proposing a sacred architecture solution in the Casamance region, Senegal. 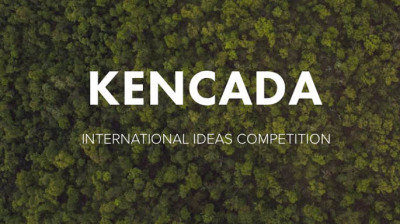 ASA studio receives Honorable Mention for ​TROPICAL COURTYARDS: Stimulation by Design & Environmental Response, design for the new KenCada International Academy in Mombasa, Kenya. Click on the image for the results. ASA studio receives Honorable Mention for ​SOCIALLY ACTIVE ECOSYSTEMS at the Laka Competition 2016: Architecture that Reacts. Click on the image for the results. 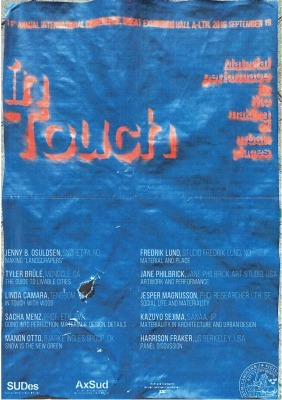 ASA studio invited to SUDes 2016 Annual International Conference “In Touch: Material Performance in the Making of Urban Places” at Lund University, Architecture and Built Environment, Lund, Sweden. Alice Tasca, ASA partner architect presents at the SFC conference, organized by JENGA and UN-Habitat and hosted at the UN Headquarters in Nairobi, Kenya. 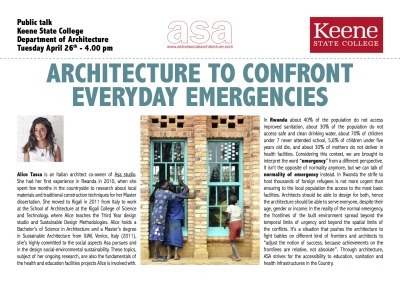 The topic "Social Architecture to confront everyday emergencies in Rwanda". Alice Tasca and Zeno Riondato, ASA partner architects present the work of the firm at ERA Architects in Toronto, Canada. ASA studio is awarded the first price at Urban Urge with the project "Cultivating Communities"
With the project Gobezay School in Etiopia, ASA studio is selected for the Young Architect Award and exhibited the Architecture Biennale in Venice.